Kato makes a variety of Unitrack for both ground-level and elevated (viaduct) use, as well as a number of bridges. The viaduct and bridge tracks are designed to work with each other and with the same support piers, and both can connect directly to ground-level track (special ramp tracks are needed to go from ground to elevated if the ground-level track isn’t raised on some kind of elevated scenery). In addition to the numeric model numbers for track packages (e.g., 20-871) Kato also assigns alphanumeric labels to individual kinds of track and these are sometimes used in parts lists and on website descriptions. These are composed of a letter-based prefix, numeric information about the track dimensions, and a letter-based suffix. The prefix designates straight (“S”), curved (“R”), double-track straight (“WS”) or double-track curved (“WR”) track. For straight track this is followed by the length in millimeters (e.g., WS186), for curves by the radius of the curve in millimeters and by the arc of the curve in degrees (e.g., R718-15 is a 718mm curve of 15-degrees). In double-track curves, both track radii will be listed, separated by a slash (e.g., “WR414/381-45PC” for track with an outer 414mm and inner 381mm curve, both of 45 degrees, using “precast concrete” ties). An optional suffix tells what design of track is used: No suffix usually means that this is ordinary wooden-tie table-top track (but single-track viaduct is sometimes described this way). “PC” means concrete-tie track, “VPC” means concrete-tie in a viaduct, “VS” means concrete-slab in a viaduct. Confusingly, “V” can be used to mean single-track or double-track viaduct (the prefix differentiates the two), but is sometimes omitted altogether for single-track (see the V2 description below). For example, I have a package of 186mm single-track viaduct straight sections. The package is marked “S186V”, but the actual viaduct casting is marked simply “S186”. Example: WS248VS is a “Double-track Straight, 248mm, Viaduct Slab” element, while WS248VPC is a “Double-track Straight, 248mm, Viaduct Precast Concrete tie” element. A simple non-viaduct “Double-track Straight, 248mm, Precast Concrete tie” element would be WS248PC, without the “V”. - “AL” and “AR” are used to designate the banked-track adapters, which are flat at one end and banked at the other, these come in “Left” and “Right” versions. - “INC” (presumably meaning “incline”) is used for the starting ramp for double-track “ground to viaduct” grades. 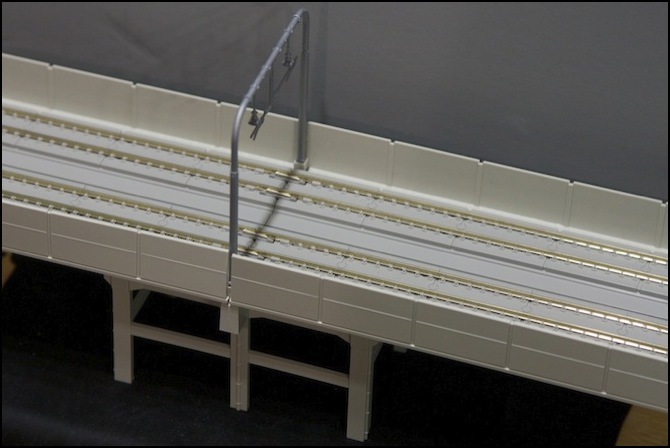 Although I make minimal use of it on my current layout, Kato has an extensive selection of single- and double-track with molded plastic sections designed to resemble the pre-cast concrete bridges used to form overhead trackage. 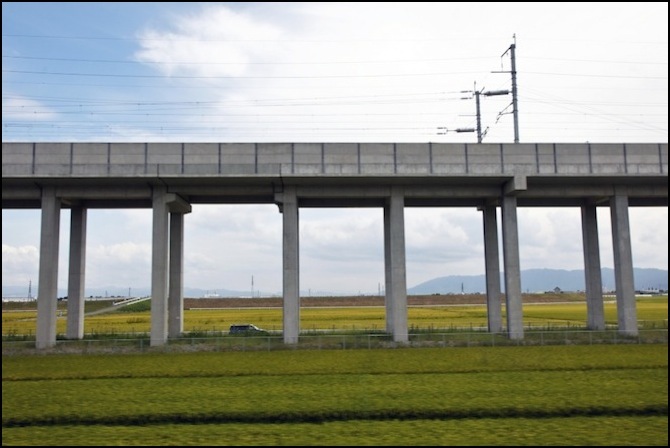 While this is mainly used in urban areas, the Shinkansen lines will sometimes use this to cross agricultural or small-town areas to allow use of the straightest possible path with minimal disruption to existing uses of the land below. I have detailed the catenary (overhead wiring) structures used with viaduct track on the Kato Catenary, Catenary and Track and Viaduct Catenary page, and the Viaduct Station Set and related materials on the Other Kato Stations page, so I won’t repeat that material here, but I will describe how it fits into the overall system. 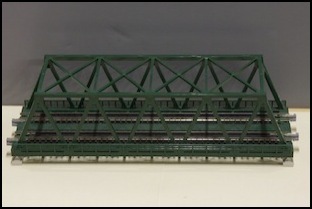 Kato’s single-track viaduct replicates wooden-tie track in a ballasted-deck arrangement. Before Kato made the superelevated curves, viaduct track was available using double-track in their “concrete slab” style (appropriate to high-speed and mass-transit systems), however some current versions of curves use the concrete-tie form. While current “concrete slab” curves are reportedly superelevated (I don’t have any of those), the older form was not; those appear to have used different part numbers, no longer listed even as “discontinued”. 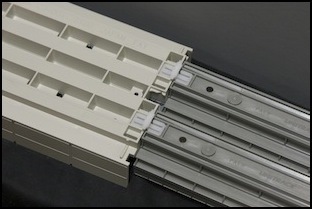 Kato’s approach to viaduct is to make a plastic molding of the viaduct structure, into which a normal section of Unitrack can be snapped or screwed. This comes in one-track and two-track versions, and is sold with the track pre-installed, however it can be removed (with some care) and replaced. You can, for example, swap old non-superelevated track out and replace it with the new superelevated track, provided you can get it in the appropriate lengths and radius. You can also remove the track from the viaduct and use it on a table-top, if you end up with viaduct sections you don’t need. I did this with most of my original concrete-tie viaduct when I built the current layout and eliminated the overhead track of the old Kitchen Table Layout. 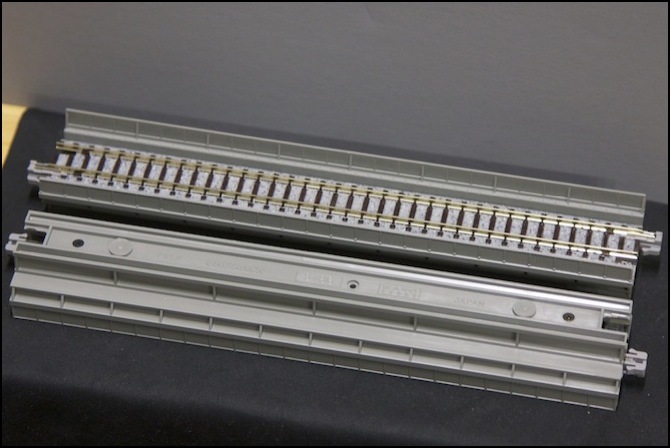 Unitrack elements are mostly self-explanatory: straight tracks are straight, in various lengths of millimeters (e.g., a “186 straight” is 186mm long). These are mostly multiples of 62mm (62, 124, 186, 248), although there are a few special sizes. 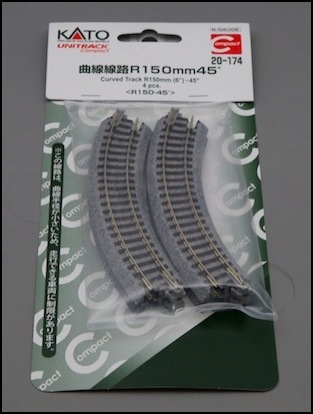 Curved tracks are likewise referred to by their radius in millimeters and arc of curve in degrees (e.g., an “R718-15” curve is a 15-degree curve with a radius of 718 millimeters). The double-track viaduct sections have holes in the underside allowing Double-track Power Cords (two provided in pack 24-828) to be attached, and since the track is standard Unitrack, the usual Unijoiners (24-815) are used, and can be swapped for insulated Unijoiners (24-816) as needed. The Teminal Unijoiners (24-818, Unijoiners with wire soldered to them) probably can’t be used due to the lack of a space below for the wires (I tried this on single-track viaduct and it wouldn’t fit; I think double-track viaduct is the same, but I haven’t checked). 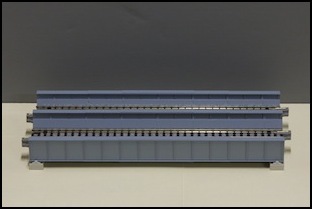 While Kato makes a double-track concrete-tie 62mm feeder track, this can’t be used in viaduct due to the hole placement, although both it and the terminal Unijoiners could be used in a viaduct station, along with similar single-track feeders (hiding the wiring is a bit hard to do though). 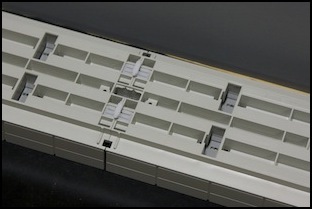 All viaduct sections clip together using white S-Joiners (up to three on double-track viaduct). These are used at the ends to attach sections together, and to attach piers and catenary supports to the underside of the viaduct. S-joiners are also used to attach viaduct track to the Viaduct Station elements, and to attach those elements together. When Kato’s standard supports are used, the track actually floats about 1/8” above them (3 mm), held up by the white S-joiners. This puts the bottom of the actual Unitrack inside the viaduct at a height of exactly 60mm above the “ground” (2 3/8”). Clearance below the viaduct is 51mm (or 2”), so a train on unitrack laid on the ground can pass below the viaduct, but only just barely. If the track is raised on any kind of roadbed, there likely won’t be sufficient clearance. Kato’s single track comes in wooden-tie and concrete-tie versions, in a variety of lengths and curvatures. Most of these are multiples of 62mm, but a few come in odd sizes. 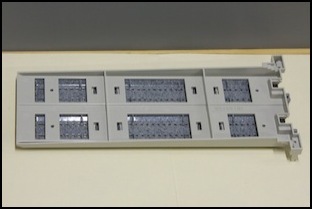 For example, the 64mm straight is useful with #6 turnouts for extending the siding spacing to fit around a platform. Note that R282 curves are used in a number of starter sets, but Shinkansen typically need larger radii to work well (R383 minimum), and they’ll look a bit odd unless they are on very large radii curves, simply because the cars are so long they overhang the curve significantly. The R718 curve (20-150) matches the curve of the standard #6 turnout, and the R481 curve (20-160) matches the curve of the #4 turnout. This is a set of two straight track sections depicting a pit between the rails, with steps at each end. It differs from 20-116 in the way the rails are mounted outside the pit, and the width of the pit between the rails. This was released in late 2016, and as of Spring 2017 I have not seen this other than from Japanese suppliers. This track is also supplied as the interior track in 23-240, the Roundhouse, and appears to actually be an inspection pit, despite the name. Kato’s Japanese site lists the part as 20-015, but the retail site I checked has it as 20-115. This is a set of two straight track sections depicting a pit between the rails, with steps at each end. This kind of track is found in maintenance shops. It differs from 20-115 in the way the rails are mounted outside the pit, and the width of the pit between the rails. It is probably intended to be a more modern, diesel-era, inspection pit. This was released in late 2016, and as of Spring 2017 I have not seen this other than from Japanese suppliers. Kato’s Japanese site lists the part as 20-016, but the retail site I checked has it as 20-116. This is a simple straight track with detachable ramps on either side and molded “boards” between the rails to give the appearance of a rural grade crossing. It does not include any signs or electronics. The “board” are angled at the ends, and function as a rerailer to push wheels back onto the tracks if they’ve come off. 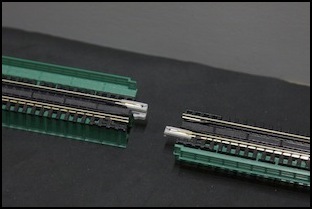 There is also a flat side piece, so two (or more) can be placed side-by-side at the usual Unitrack double-track spacing. 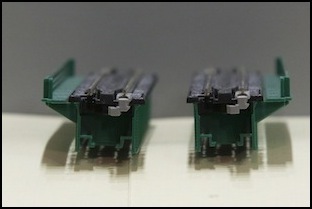 This is an uncoupler for Kadee or similar magnetic couplers. This is a single-track feeder track, with a socket underneath and a wire to connect it to a Kato power pack. 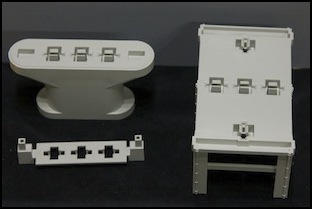 This is an adapter for connecting Unitrack or ordinary sectional or flex-track. It was originally developed for use with Tomix FineTrack, but also works with other brands provided that their ties are less than 19mm in overall width. End of track bumper with a large concrete-block style bumper. End of track bumper with a wooden box filled with ballast for the bumper. End of track bumper with a typical bumper formed of bent rails (roughly equivalent to the U.S. prototype, although it comes with a Japanese-style end-of-track sign to mount on the bumper to match the Japanese prototype). This is shorter than the other bumpers, but can be extended to match them using a 45mm straight (this will take up more real-estate, but the end-of-track should be at about the same location). This is an extensible track segment, useful for making things fit when a standard size won’t work. End of track bumper with a tie across the rails and both rails bent up to form wheel stops. This is, per Kato, a typical style used in low-speed stations and on local lines. This set contains two 45mm and eight 29mm segments. The 33mm segment can be used on a 90-degree curve to adjust center-to-center spacing from 66mm to 33mm. 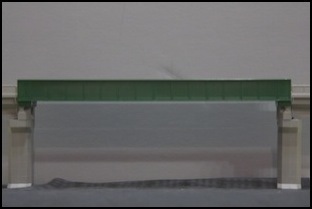 The 35mm segment can be used when constructing figure-8 layouts with a 90-degree crossing in the center. This is a length of straight track with a signal to one side. Confusingly, the same part number is used for two different signals. In Japan, the signal is on the left, appropriate for left-running double-track. In the U.S., the signal is on the right, appropriate for right-running track. The two are NOT identical, and the signal cannot be reversed to make one into the other. This is covered in more detail on my DC Signals page. This is track that goes along with their compact switches for Unitram use. It is typical wooden-tie Unitrack except for the sharp-radius curves. These come in three radii, which can be nested inside each other. Kato has a number of different sizes of single-track viaduct. These all use their older “wood tie” Unitrack, but as noted this could be removed (it’s attached with screws) and replaced by concrete tie track where available (note that at present, curved single-track Unitrack is not available with concrete ties). 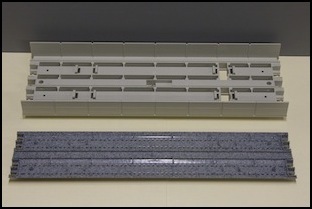 Most track sets (except the signal base) come with two viaduct elements of the specified size per pack. 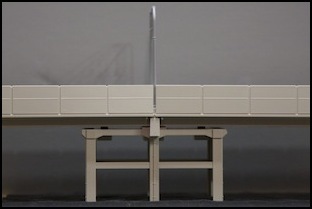 These elements can also be used as another way to model a ballasted-deck bridge. Single-track viaduct curves have a high wall, which can be problematic in the smaller radii for long cars, such as Shinkansen. There’s no simple answer for “will it work?” here, you probably need to buy the track and train and test them together. I don’t use this (except for a few straight sections) so I don’t have any answers. 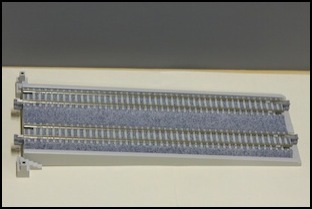 Note that there is no provision for any of the odd sizes of straight track (e.g., 64mm, or the multi-size set with 29mm and 45.5mm pieces). Nor does there appear to be any way to connect power feeders to this track (but I don’t have a lot of experience with it, so I may have overlooked something). The terminal unijoiners won’t work (I tried), because the wires exit sideways and the unijoiner abuts a solid chunk of plastic. If you’re handy with a soldering iron you could wire vertically to the unijoiners and take the wires down through the S-joiner hole, but if you did that pier couldn’t be attached with an S-joiner. Note that there is no provision for R216 (or the new smaller tram sizes), or the two switch curves (R481 and R718). Kato makes two styles of single-track support. You can also support two viaduct track elements using a double-track support, described separately. The two styles are both a solid concrete post. One represents a cast-in-place style with a wider base and top and angular ends, while the other represents a newer pre-cast style, with curved ends and only a slightly-wider base. The latter is only available in a full-height version. Kato describes their viaduct supports as “50mm (2 inch)” in height. This actually refers to the clearance under them, which is suitable for a train placed on table-top track. The actual height of the piers is 48mm, and with a viaduct section clipped on top, the base of the Unitrack is 60mm above the surrounding “ground” level. The grade created by the viaduct incline will vary depending on the length of track used between piers, but can be quite steep. This is usually fine for Kato trains (which are rated for 4% grades) and the short length of trains used on Japanese layouts, but may be excessive for longer trains of those of other manufacturers. 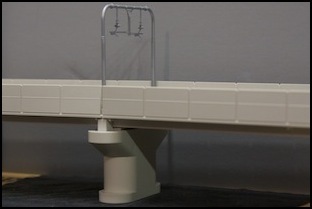 Along with the curved bridge (see Single-Track Bridge section below) Kato release a new bridge pier, replicating a tapered concrete cylinder with a service catwalk around the top and a mounting point for a catenary (electrical line) pole. For matching electrical poles, see 23-058, although apparently other pole types will also work. Pier height is the same 50mm (2”) used for other single-track piers. 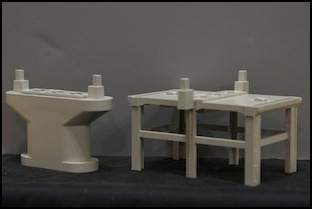 Kato recommends pier 23-047 (poured style single-track piers) for use with these (on the prototype, the rectangular 23-047 is used on land, and the cylindrical 23-069 in a riverbed). Kato makes ground-level double-track. The curves for this are banked, with adapter sections used at each end. This is actually the same track as is used in concrete-tie double-track viaduct, but in addition to the 381/414 size there is also a tighter 315/282 size (too sharp for Shinkansen use, but okay for Kato commuter trains) and a broader 447/480mm version. Note the “inner” (381/414) and “outer” (447/480) tracks can be combined to create a four-track curve with enough space between them for Kato’s four-track catenary (which has a single pole between the inner and outer sets). This is appropriate for modern track in Japan, although much existing track is wooden-tie, and newer construction sometimes uses the concrete-slab design instead. This is a ground-level feeder track, similar to single-track 20-041. It has a socket under each track, and a pair of wires for connecting each to a Kato power pack. This is appropriate for both Shinkansen and commuter tracks in Japan, although slab track is more typical of elevated and tunnel construction than ground-level lines. This is a ground-level feeder track, similar to 20-043. It has a socket under each track, and a pair of wires for connecting each to a Kato power pack. See also the Passenger Platforms page for additional double-track related to stations. Kato makes viaduct for double-track, which is more typical of both Shinkansen and urban commuter lines than single-track. However, they presently only make it in the R381/R414 radius, the middle of their three sizes of double-track curves. Double-track viaduct track is actually two separate components: the viaduct casting and the track. The track is actually simple Unitrack, which snaps into the casting using tabs molded to the underside of the track that mates with holes in the casting. Don’t confuse viaduct track with “plate” track. Kato made several kinds of “double-track plate” track. This was ground-level track attached to a scenic base, allowing fencing and other details to be added. 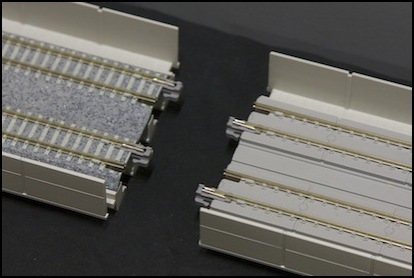 Double-track viaduct track comes in both Concrete Slab and Concrete Tie versions. The “slab” style is typical of Shinkansen lines, but may also be used for heavy-use (e.g., subway or urban commuter) lines. However, except for set V12 all of it appears to be of the concrete-slab style. Kato uses “PC” (short for pre-cast concrete) to refer to concrete-tie track, but sometimes applies this to concrete-slab track (as in the description of V13, which by other sources uses concrete slab-style track). Note that there is no 62mm standard straight section. This means that the double-track feeder (20-043) cannot be used in viaduct (although it could be used within a viaduct station). There are curved viaduct tracks, but only in one radius. The “easement” set is required to transition from level to superelevated track. A 180° curve that is level at both ends requires three 45° sections and a pair of easements. Because you always need both easements, and the only other arc is 45-degrees, this means that you can only create curves in multiples of 45-degree (one-eighth) turns. There is no option for 30-degree curves as found on the single-track viaduct. Note: 45-degree sections of non-banked concrete-slab style double-track viaduct were previously available as part 20-541. This was discontinued some time ago, and no longer appears even on Kato’s Japanese-language stock list. Double-track viaduct has an opening in the underside to allow power-pack wiring to be connected using the Double-track Power Cord (24-828), actually a pair of power cords each ending in a big rectangular plug with pins that contact the rail from the underside. 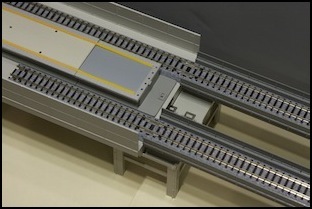 Since there are two of these, you can wire each track to a separate power-pack, the same as you would on level ground using the Double-track Feeder (20-043). 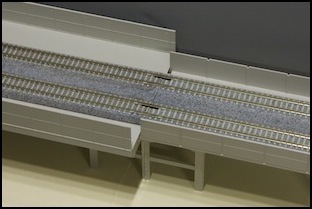 Double-track and single-track viaduct are compatible and can be connected together as shown below. Kato makes two styles of double-track support: a precast-concrete style (23-020 and the now-discontinued 23-018, see the catenary page for more on those) and poured-concrete style (23-019). The precast style replicates a box of concrete girders, representative of the style typically found in urban areas, which allows for higher viaducts (something Kato doesn’t take advantage of) and makes space below the pier usable. The poured style has a single post with rounded ends and a larger base and top, and represents a style found in river crossings and in lower-elevation rural stretches of viaduct. Both support up to three S-joiners across the middle of the top, supporting either one double-track viaduct or two single-track viaduct sections on each side. The pre-cast style also provide for single Unijoiners at each end, which can be used when supporting viaduct station platform sections, but is oriented the wrong way for supporting double-track viaduct (more on this below). Note: there’s some variation in how these are named. Kato USA refers to 23-019 as “pre-cast” and indeed they are similar to the single-track style I called pre-cast above, so I may have been confused when I called them “poured”. The older style, which I’m calling pre-cast here, is actually called “pre-cast” on the box although Kato USA doesn’t use that terminology. I probably need to come up with different generic labels for these styles. As with single-track viaduct supports, Kato describes their viaduct supports as “50mm (2 inch)” in height. This actually refers to the clearance under viaduct supported by them, which is suitable for a train placed on table-top track. The actual height of the piers is 48mm, and with a viaduct section clipped on top, the base of the Unitrack is 60mm above the surrounding “ground” level. - This set includes parts for both up and down grades. 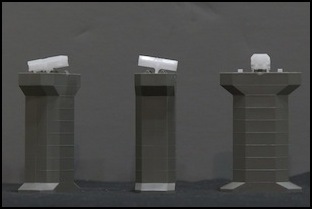 - added to 23-048 or the V12 set set 23-049 set provides intermediate-height piers for a more gradual slope. Includes parts for both up and down grades. - It’s not clear if the incline section at the end uses slab or concrete-tie style track. The ones from the V12 set use concrete-tie track. Note: the angled 186mm piece needed to go from level track to a grade is a special piece (WS186INC) not sold separately. It is only available in the V12 set or the 23-048 set. See the description of set V12 for a picture. 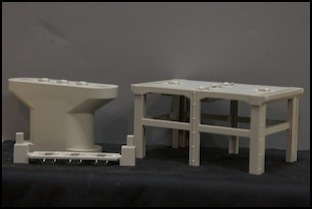 The Viaduct Station set (23-125 and associated sets) provides a set of flat plates that mount atop the pre-cast style piers. These use the two outer holes, and thus aren’t really suited to the poured-style supports (you can use those with a single S-joiner, but that may be a bit wobbly). Both single and double-track viaduct can be connected to these plates (and that’s really the only way to get into a station). These come in segments roughly 100mm wide and 248mm long, which can be arranged to any length or width. Some end-plates are provided to fill gaps where viaduct doesn’t take up the full width of the end, but these don’t fully fill all gaps (see photos below). 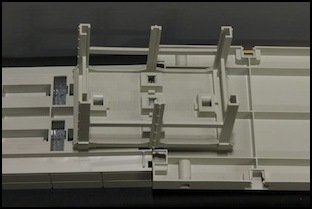 Note: the Viaduct Platform Extension Set (23-232) contains two segments and the outer walls. This could be used to make a form of straight viaduct (or a section on a viaduct) if you wanted to use incompatible Unitrack elements such as feeders or signals. 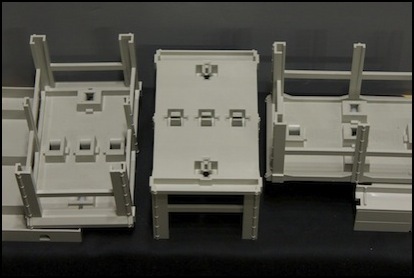 Any ordinary Unitrack that will fit (and that’s pretty much all of it) can be used on the Viaduct Platforms, because they just create a raised flat surface, and don’t have any attachments for the track itself. 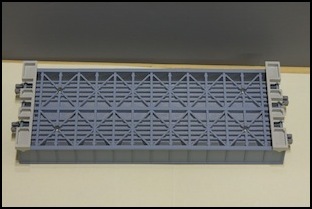 The pre-cast style of support has two different patterns of S-joiner holes on it: a row of three lengthwise that mates with the double-track viaduct, and two outer holes at the appropriate spacing for attaching to the underside of a viaduct platform plate, as shown below. Double-track viaduct connecting to a station, only the center S-joiner is used in this case because the outer holes don’t match on the two structures. Single-track viaduct can be connected to station plates as well, using any of the three S-joiners, but in the right-hand version, the track spacing would not line up with double-track elsewhere. Kato makes pre-packaged sets of Unitrack. These can be a more economical way of buying track, but the savings are often minor, and if you end up with a bunch of elements you don’t need, may be more expensive. For viaduct, there are several sets of interest, and the Kato U.S.A. sets use a different part number from the Japanese versions, implying that there is some difference to the sets (this could merely be packaging differences; but take the parts lists below with a grain of salt, as they come from Kato Japan and may not exactly match). In addition to the numeric model numbers for track packages (e.g., 20-871) Kato also assigns alphanumeric labels to individual kinds of track. The prefix designates straight (“WS”) or curved (“WR”) track. In the descriptions below, the suffix on these tells what design of track is used: WS248VS is a “Straight, 248mm, Viaduct Slab” element, while WS248VPC is a “Straight, 248mm, Viaduct Precast Concrete tie” element (PC = concrete tie). Note the use of “V”, which separates track in viaduct from ordinary track, a simple “Straight, 248mm, Precast Concrete tie” element would be WS248PC, without the “V”. This uses wooden-tie Unitrack and contains track to create a full oval with up and down sections. 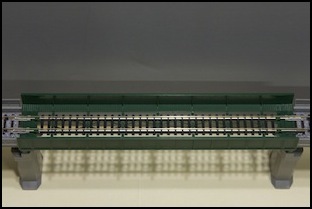 This is intended to be used with some other source of ground-level track, such as the Master 1 (M1) beginners set. This uses concrete-tie Unitrack and contains track to create a bit more than a half-oval with up and down sections. 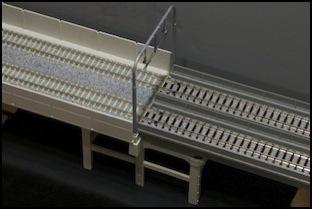 This is intended to be used with ground-level double-track sets to create an elevated portion. This appears to be the only way to get concrete-tie viaduct track, as it’s not sold separately. This set includes two WS186INC transitional pieces to bring track gently from level ground into the viaduct (effectively forming a vertical easement). These use concrete-tie track sections that are snapped in the same as on the viaduct. This uses concrete-slab Unitrack and contains track to create a full elevated oval (no up/down sections). Note: It’s not clear why Kato used “PC” in the description. Both Kato Japan and Kato USA make it clear in descriptions that this is slab track, and pictures I’ve seen online confirm that. Also, the individual track elements are described as “VS” (meaning “viaduct slab”) rather than “VPC” (meaning viaduct pre-cast concrete tie”). 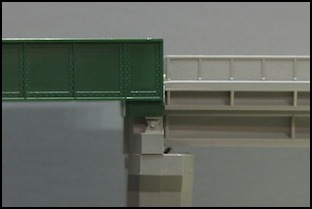 Kato makes several style of single-track and double-track bridges that are compatible with the viaduct track. All bridges other than the double-track girder bridge use wooden-tie style track that is molded into the bridge; it is not removable Unitrack sections. 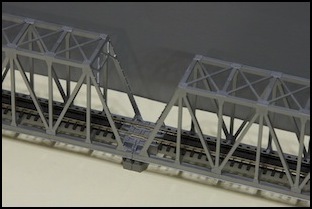 The silver and black-color bridges do not appear on Kato Japan’s stock list in any style, but do appear on Kato U.S.A.’s page (for those versions that exist), and may represent models only made for the U.S. market. Kato makes three styles of single-track bridge. 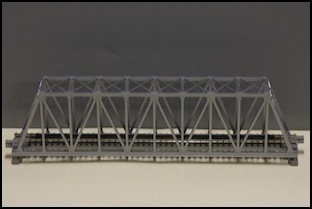 A 248mm truss style, a 186mm plate-girder style, and a 124mm bridge described as a plate-girder, but different in style from the 186mm, having only one side (but not designed to be used side-by-side; there’s a gap at the standard spacing). Note: 20-463 is not listed by either Kato U.S.A. or Kato Japan, and presumably is reserved for Silver, a color that does not presently exist in this size. 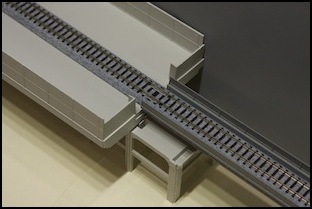 The Short (124mm) Plate Girder bridge has a catwalk and railing on only one side, and is unique in using a special Unijoiner due to size constraints (it will mate with track equipped with standard Unijoiners, only one one on each end is the small version). This prevents insulated joints or the Unijointer power feeder from being used at the ends of these bridges. Short (124mm) Plate Girder bridge showing special Unijoiners and asymmetry. Left picture is at standard double-track spacing. These are actually straight bridges with curved track, which correctly replicates the prototype. All of these are based on a particular bridge on the Iida line in Japan. These were released in November 2016, and as of early 2017 do not yet appear to be available outside Japan. I don’t have any of these to photograph, but based on online material the look is very similar to the 20-460 series Plate Girder bridge: an open-topped bridge with a catwalk along one side. The catwalk is positioned on the inside of the curve. The curve radius is 448mm (17 5/8”), which is broader than any available single-track Unitrack today (other than the R718 curve used with #6 switches). The bridge is available in several colors individually, or in a set of four green bridges with piers and catenary poles. Each bridge is a 15-degree curve. Note: the “warren brace” catenary poles are an older style of riveted box girder (similar to those used in the U.S. in the early 20th century). Per Kato’s comments these were apparently also used on some Shinkansen lines. They are available separately in a 12-pack: 23-058, “Unitrack Single Track Warren Brace Catenary Pole (with Catenary Poles Stand for Bridge Retainer)”. 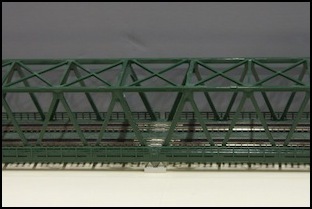 Kato makes two style of double-track bridge, a 248mm truss style and a 186mm plate-girder style. The truss style comes with a section that can be clipped between two bridges to make a longer bridge with a continuous truss. Both styles are available in several colors.